Relax with some refreshments at the Island Juice Bar. The coconut waters and island fruit juices will quench your thirst after a fun-filled day in the sun. Beachgoers can prop up their surfboard on the rocks while enjoying their beverage. Once rehydrated, climb the rocks and whoosh down the slide to the cave below. Watch out for the floating sea turtle resting inside! 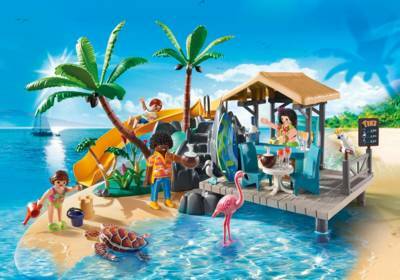 Set includes four figures, table, chairs, slide, flamingo and other tropical birds, palm trees, sand toys, and many other accessories. Recommended for ages six and up. Dimensions: 15.7x16.9x9.8 inches (LxWxH).Warning. Choking Hazard. Small parts. Not for children under 3 years.